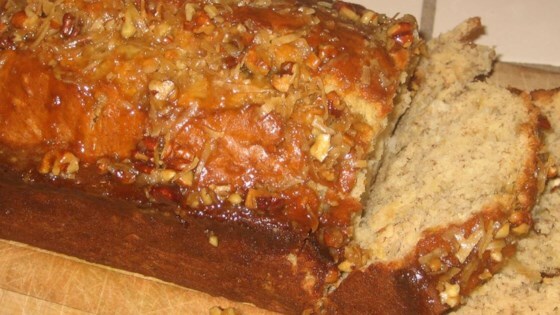 "Delicious and exotic twist on the common and bland banana bread. So good you will never bake another run-of-the-mill banana bread! Serve and watch the happy faces!" Preheat oven to 375 degrees F (190 degrees C). Lightly grease two 8x4 inch loaf pans. Beat together 2 tablespoons of softened butter and cream cheese in a large bowl until fluffy. Slowly beat in sugar until well incorporated. Add the egg and mix well. Sift together the flour, baking powder, baking soda, and salt in a separate bowl. In a different bowl, mix together the bananas, milk, 2 tablespoons rum, lime zest, lime juice, and vanilla extract; stir well. Pour 1/3 of the flour mixture into the butter and mix well. Mix in 1/2 of the mashed bananas. Continue with another 1/3 of the flour, followed by the remaining banana mixture, and finally the remaining flour. Fold in 1/4 cup pecans and 1/4 cup coconut flakes. Pour the mixture into the loaf pans, and bake in the preheated oven until a toothpick inserted into the center comes out clean, about one hour. When finished, cool for 10 minutes in the pan, remove, and finish cooling on a wire rack. After you take the banana bread out of the oven, prepare the topping by stirring together the brown sugar, remaining butter, lime juice, and 2 teaspoons of rum in a small saucepan over medium-high heat. Bring to a simmer stirring constantly; cook until the sugar has dissolved and the mixture is smooth, about one minute. Remove from heat, and stir in 2 tablespoons pecans, and 2 tablespoons coconut. Spoon this topping over the loaves while they are still warm. The topping will harden slightly when the loaf cools. See how to make a moist, old-fashioned banana bread. Really nice flavor ~ pressed the topping in to cake before baking. Topping stuck to the top and was really crunchy. Family loved it.